This year I’ve been doing quite a bit of interior photography work for S.E.A. 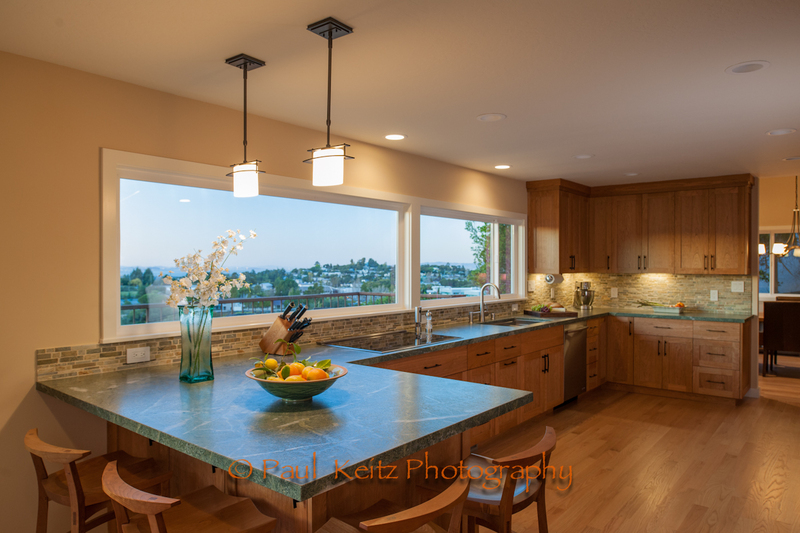 Construction (San Mateo, CA) and last week their head of marketing and business development, Petalyn Albert, informed me the one of the interior remodels that I had photographed had won a statewide award for interior kitchen renovation. Cool! Needless to say it was a pretty difficult kitchen to capture because of the huge window that ran the entire length of the kitchen. It was requested that I capture blue sky in the images to highlight the view. Just great! It was only 9am and my poor D3x couldn’t handle it. Lens flare and blinkies (actually just one gigantic blinkie where the window was) everywhere on the LCD. Fill flash didn’t look natural at the power I needed to balance the light and HDR bracketing didn’t look like it was going to work either because of lens flare (blooming) when over exposing the windows. What to do? I punted and went home! But, I came back when the sun was lower on the horizon and mother nature had done the balancing act for me. Shooting with crossover light has its own challenges and one has to work fast because the good light is very transient. In the end, I captured a great set of images and everyone was pleased. Petalyn made the following video to celebrate the award which features the images from the shoot. 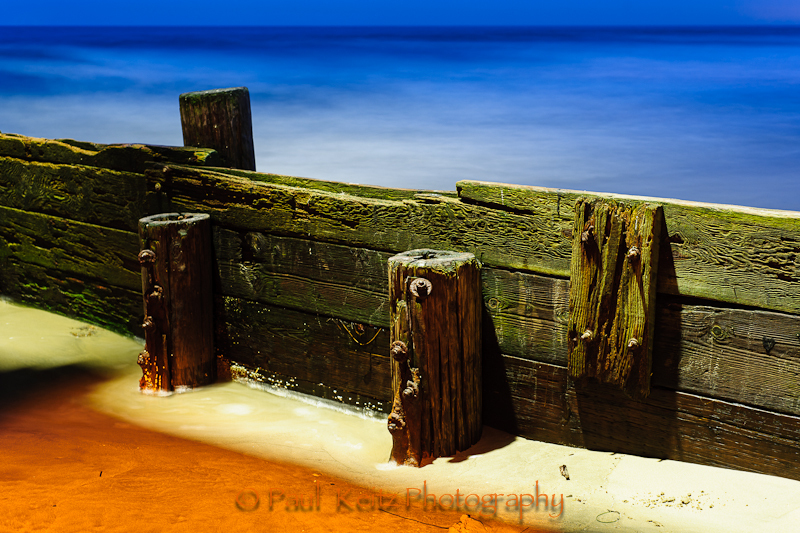 You can see the full gallery on my website using the link at the top of this page. One of the things I really like about digital cameras is their sensitivity to color temperature. The human visual system naturally adjusts to color temperature in order for our minds to see things as “normal”. Set your camera to daylight white balance and take a picture in the shade and everything has a blue cast to it because shady light is, well, blueish. 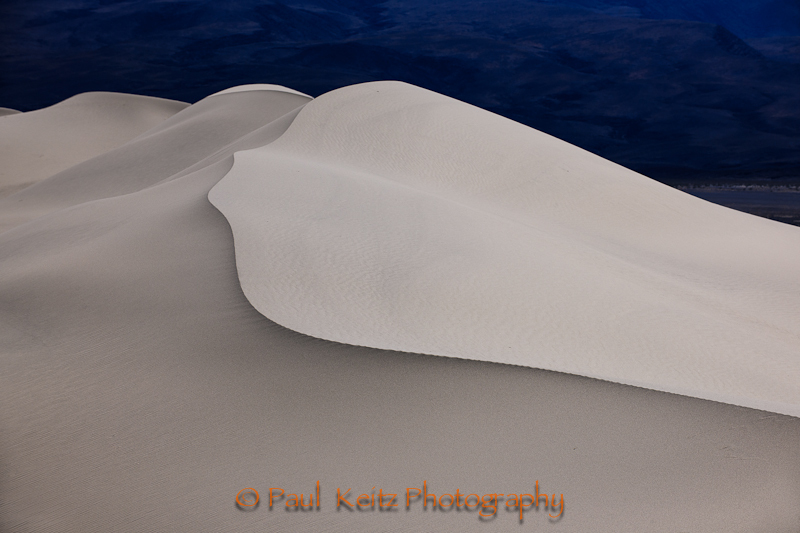 As case in point is “Leading Line” above where the white balance was set to best retain the color in the dunes and underexposed to increase the shadows. The distant mountains which were in deep shadow from the late afternoon sun appear as an unwashed denim blue creating a striking contrast to the tan tunes. 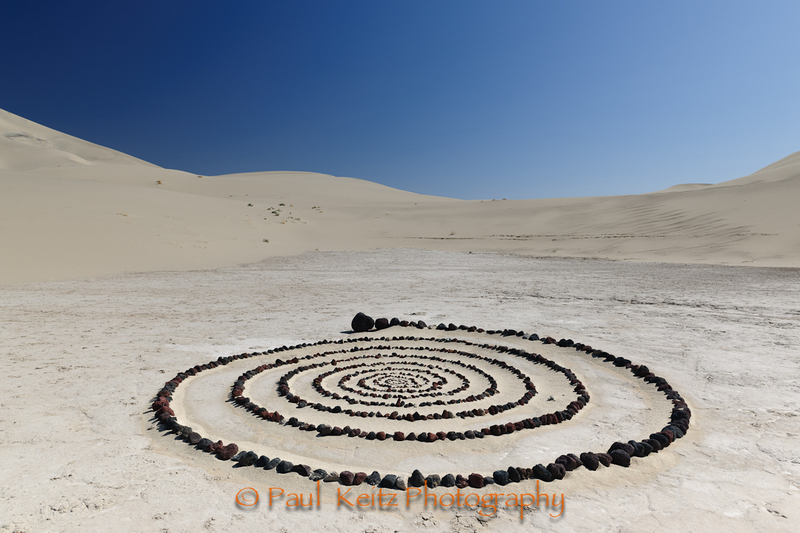 While my friend Gus and I were searching for interesting patterns in the dunes, we spotted this spiral of pumice stones in a dry “pond” bed. It must of taken someone considerable effort to get the rocks there. The rocks were not particularly small, and for pumice, not particularly light. I was hauling about 25 pounds of gear on the dunes and it was pretty tiring. Lugging a pack full rocks to this place couldn’t have been fun, especially since it looked like it would require a few trips. Gus suggested going low and wide for the shot. Normally, I like to follow my own instincts about a composition but Gus has a really good eye so I listen. Thanks Gus. Fitting, it came out pretty otherworldly looking. Doesn't look at that cold. After dropping off the family back at home from spring break, I repacked with warmer clothes and headed out with my good friend Gus Bergnes for a photography road trip to Mono Lake, the Alabama Hills and Death Valley. Warmer clothes turned out to be a relative term, at least at Mono Lake. 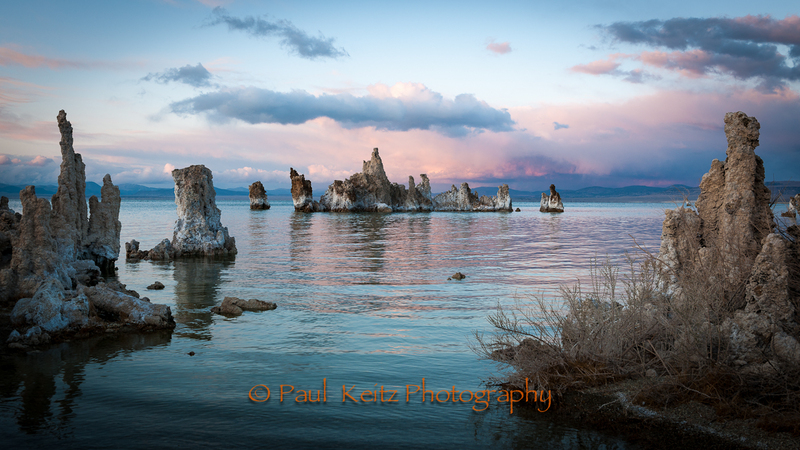 Sure, warmer than the shorts and T-shirts over spring break but brrrrr not warm enough for the temps in the teens at Mono Lake. Gus was not all too happy about his decision to leave his balaclava at home. “It’s not the temperature, it’s the wawawawind”. We got lucky with some clouds the first evening when this shot was taken but it was, unfortunately, blue skies for the rest of the trip. Some guy, the only other person out there I think, kept walking in to my field of view while I was shooting at this spot. He was pretty polite about moving out of the way when I asked if he hoping for me to take his portrait among the tufa. Eventually he come over to have a look on my LCD at my images. Remarkably, after seeing this photo, he proceeded diss the composition and started to lecture me about where to put my camera and how I should frame the shot, actually pointing at ground to the very spot where I should put my tripod. Geez, nice to meet you too. Gus and I had a good laugh about it while reviving our hands holding bowls of chicken noodle soup at the Tiger Bar in June Lake.